We here at MEGELLA™ started off with a love for making people feel better. After realizing that our true passion didn’t lie in patient care, we began our best work behind the scenes in the lab. That’s when MEGELLA™ was born. We thought of the most widely used and effective pain reliever and acetylsalicylic acid came to mind. However, when we pitched our idea to various distributors, we were often shut down; nobody would take us seriously. We were three women trying to make a difference in the male-dominated pharmaceutical world. Finally, we decided to be our own distributor and run our company by our own rules. Our products are made with the utmost care and love, ensuring that the product we deliver to you is made with the best materials that we can attain. We don’t think that you should be worried about the harmful effects of your medicine. Our mission is to make real medicine, made with love and care, for real people. A common method for testing purity is colorimetry. This technique measures how pure a sample is based on how concentrated the color in a substance is. The concentration of a colored substance (or one that can be reacted to form a colored substance) has a proportional relationship to the intensity of the color in the sample. A spectrophotometer (a device for measuring light intensity) shines a light of a specific wavelength through a sample and some of it is absorbed. By comparing the amount of light that enters the sample to the amount of light that exits the sample, the spectrophotometer measures the amount of light that is absorbed by the sample. The absorbance value is proportional to the concentration of the colored substance in the sample. A high concentration in the sample signifies a low amount of light which passed through it, while a low concentration value signifies a large amount of light passed through the sample. Finding the melting point temperature of a substance is a method used to test the relative purity of the sample. The melting point of a substance is a temperature range of when the solid begins to melt to when the solid has completely melted. For pure substances, the temperature range should usually be 1-2°C at the most, while an impure substance will lower the sample’s melting point as well as widen the melting point temperature range. In a pure sample, all of the particles are the same so they are packed together in a very orderly fashion and their attractive forces are maximized. Impure samples, cause a flaw in the structure, so it requires less energy to break the particle bonds. This in turn causes the melting point temperature range to widen because different parts of the sample may contain different amounts of impurities, which varies the amount of energy required to melt the solid. Lastly, recrystallization is a purification technique for solids based on differences in solubility of the desired product and impurities in the sample. When an impure sample is dissolved and allowed to return to its solid state slowly, the crystals will grow so that they incorporate only the same particles which fit together properly in a crystal lattice structure. Recrystallisation was a process that occurred in many stages of the experiment. In this process, the right half of the acetic anhydride structure bonds with the salicylic acid thus forming the right half of the acetylsalicylic acid structure. While the left half of the acetic anhydride structure is left as the acetic acid product of the reaction. Refer to Figure 2 for diagram of reaction. Water must be added to the reaction after all of the salicylic acid has been converted to acetylsalicylic acid so that the acetic anhydride can be converted to acetic acid via hydrolysis — the splitting of molecules by water. This reaction is intended to produce acetic acid. If the reaction occurs as expected, there would be phosphoric acid, acetylsalicylic acid, and acetic acid left in the flask. Once the contents of the flask are vacuum filtered, the solid should be pure acetylsalicylic acid (since it is not water soluble) while the phosphoric acid and acetic acid are drained off. Acetylsalicylic acid is a common over-the-counter analgesic that millions of Americans use everyday to relieve muscle pain, fevers, and headaches. With so many brands, it can be difficult for the consumer to choose. What Americans need is a reliable, pure, and affordable version of aspirin. With MEGELLATM brand aspirin, you can be sure you are investing in the best stuff for your body. Here at MEGELLA™, we want our customers to understand what they’re putting into their bodies, so we want to explain the properties of the active ingredient, acetylsalicylic acid. One of the compounds used in the synthesis of aspirin is salicylic acid, which is a pain reliever in itself when extracted from willow tree bark. Unfortunately, salicylic acid is extremely bitter and can cause severe stomach irritation. It was in the 19th century that a search for a milder form of this pain reliever was conducted and resulted in the synthesis of aspirin. In this report, we will show you why our synthesis of MEGELLA™ brand aspirin is the best and how, after many extraneous tests and trials, we produced it. Generally, the synthesis of aspirin is sped up with the help of a catalyst. In order to ensure the most pure aspirin, we tested different amounts of catalyst to determine which worked the best. MEGELLA™ brand aspirin is made using phosphoric acid as the catalyst. Instead of just picking one amount of catalyst to test, we went above and beyond with our aspirin syntheses. We tested four amounts of phosphoric acid: 0.05 mL, 0.10 mL, 0.15 mL, 0.20 mL. Figure 1: Calculations done to find the molarities of the different amounts of catalyst used in each trial. Figure 2: Chemical reaction which occurs to create acetylsalicylic acid. Table 1: Molarities of the different amounts of catalyst used in each trial. Graph 1. The absorbance and concentration values found in the baseline synthesis of varying salicylic acid-Fe(NO3)3 solution samples at 520.8nm, each with different molarities. 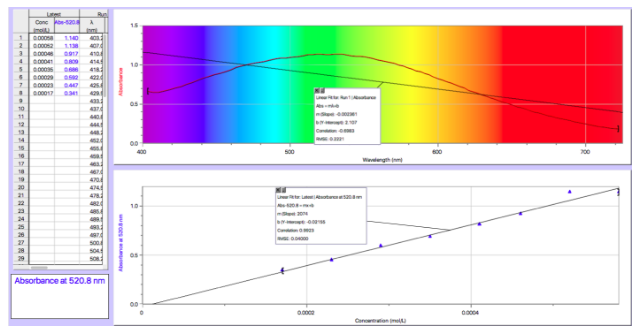 Using the optimal wavelength we found, 530.8 nm, we colorimetrically tested each of our reaction products three times. Once we found the acetylsalicylic acid product with the lowest absorbance values, we recrystallized the sample to attempt to make the sample more pure. 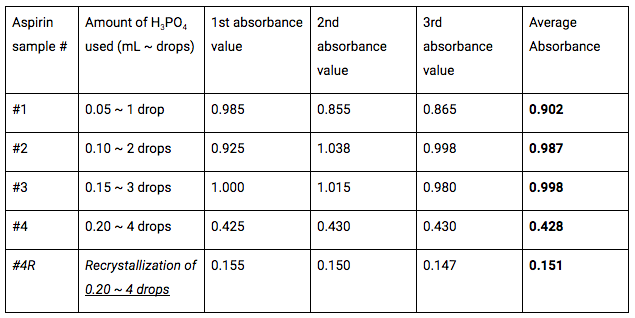 Table 2: Absorbances of each acetylsalicylic acid sample (of varying amounts of phosphoric acid) and average absorbances of each sample. From the purple color created once iron (III) nitrate was added, we were able to conclude that our syntheses for the samples created with the lower amounts of phosphoric acid did not completely convert all of the salicylic acid into acetylsalicylic acid. To quantify the purities of our synthesized acetylsalicylic acid samples with 0.20 mL of phosphoric acid, we used the line of best fit from our baseline synthesis graph (refer to Graph 1) to calculate the molarity of the salicylic acid and the percent purity of the created sample. To calculate the concentration of salicylic acid in the 50 mL sample solution, we used the line of best fit (Absorbance = 2074 (concentration of salicylic acid) - 0.02155) and plugged in the average absorbance value of each of the sample solutions tested. In order to calculate the percent purity of our samples, we first found the molarity of salicylic acid per 50 mL (0.05 L), then multiplied the resulting molarity by the molar mass of salicylic acid, to get the amount (in grams) of salicylic acid in the synthesized sample used in the 50 mL volumetric flask. We then subtracted the mass of the salicylic acid in the 50 mL sample solution from the total mass of synthesized sample used in the 50 mL volumetric flask, which resulted in the amount of acetylsalicylic acid in our sample. Finally, we divided the mass of acetylsalicylic acid by the total amount of synthesized sample used in the 50 mL sample solution, and multiplied by 100%, resulting in the purity values of our synthesized samples. 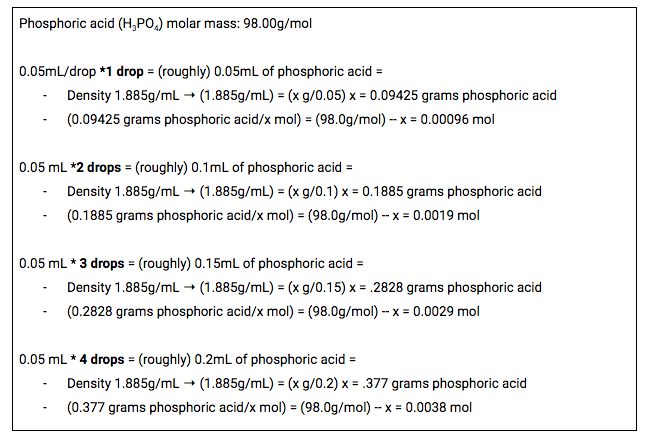 The calculations below show how the percent purity of our best resulted aspirin, which was made using 0.20 mL of phosphoric acid, was found. There is about 0.004 g of aspirin in the 50 mL solution because we started with 0.20 g aspirin, dissolved it in a 125 mL solution, took 2.5 mL of this solution and placed it in a 50 mL volumetric flask. The calculations below show how the percent purity of our recrystallized sample, which was made using 0.20 mL of phosphoric acid, was found. The synthesized acetylsalicylic acid sample made using 0.20 mL (about 4 drops) of phosphoric acid as a catalyst yielded the purest aspirin. To determine that the theoretical yield of this reaction is 1.3g of acetylsalicylic acid, we used stoichiometry and the relative ratios of reactants and products. To calculate the percent yield (actual yield/theoretical yield) of our aspirin synthesis, we first calculated the actual yield of pure acetylsalicylic acid in our 0.20 mL H3PO4 aspirin sample, since our aspirin product contained salicylic acid as well. To do this, we found what 62.5% of 0.817g (the mass of our recovered product) was and divided that (0.511g) by the theoretical yield of 1.3g determining that our percent yield of the 0.20 mL H3PO4 aspirin sample was 39.3%. The accepted melting point range of pure acetylsalicylic acid is between 134°C and 136°C, though the melting points of our synthesized samples had ranges larger than 2°C that tended to be higher than the accepted melting point range. 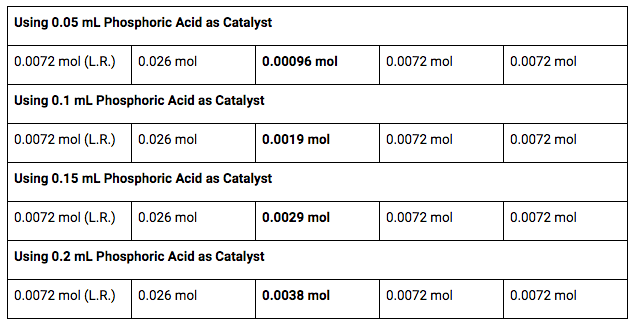 Table 3: Melting point ranges for each synthesized acetylsalicylic acid sample. Though melting point range is an accurate way of testing a substance’s purity, colorimetry is more accurate. Because of this, we are less concerned with the rather odd results retrieved while testing our synthesized acetylsalicylic acid samples. Table 4. 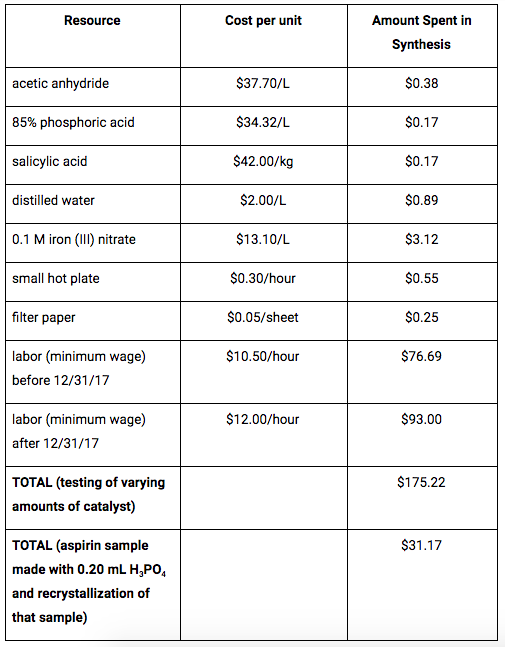 Resource cost per unit and amount spent/material in the process of creating our acetylsalicylic acid. 0.20 grams of the synthesized acetylsalicylic acid was measured and transferred to a 125 mL beaker. 5 mL of 95% ethanol was added to the beaker of the aspirin sample. The beaker was swirled to dissolve the solid. 75 mL of distilled water was added to the beaker and mixed well. The solution was then transferred to a 125 mL Erlenmeyer flask. The beaker was thoroughly rinsed with distilled water and rinse water was transferred to the Erlenmeyer flask. Distilled water was then added as needed to the Erlenmeyer flask to the 125 mL mark. 2.5 mL of the aspirin solution was transferred from the 125 mL Erlenmeyer flask to a clean, dry 50 mL volumetric flask. Approximately 47.5 mL of 0.025 M Fe(NO3)3 was added to the flask and mixed thoroughly. A cuvette was filled ¾ full with the sample then placed in the Spectrometer. The treated aspirin sample solution was tested twice more with new aliquots. This procedure was repeated with three other concentrations of phosphoric acid as catalyst, none of which yielded pure results. We plan to test 0.25 mL of phosphoric acid to see if a higher concentration of catalyst will yield acetylsalicylic acid that is more pure. We hypothesize, since the highest amount of catalyst we tested (0.2 mL) yielded the purest results, that testing a slightly larger amount will purify our product even more. Seek emergency help if any you have any signs of an allergic reaction: difficulty breathing, hives, swelling of your face, lips, tongue, or throat. Call poison control or your doctor or go to the hospital If you are coughing up blood, you have a fever lasting longer than 3 days, swelling or pain lasting longer than 10 days, or ringing in your ears.